Is there a way to engrave or carve words into leather without the use of professional engraving or stamping tools? I want to make one similar to the one in the picture, but can not find the kit to do so anywhere in my local stores. I read somewhere that it could be done by heated knife but I'm not sure. Any help, please? The one in the picture appears to be laser engraved, so I assume that that is infeasible. You could get a similar result more easily if you tried to brand it, but that still requires your design to be shaped out of metal and then heated really hot. 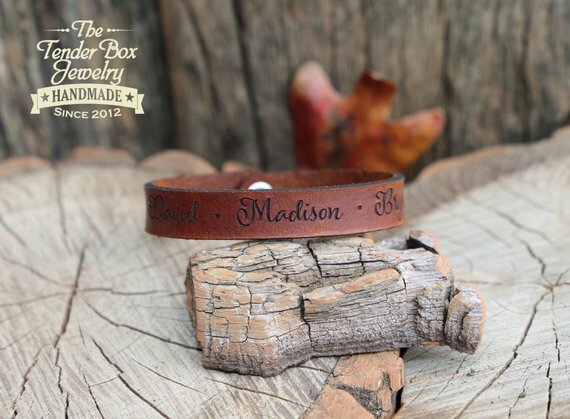 If you really want the professional look, I would suggest just buying a leather stamp online. Not the answer you're looking for? Browse other questions tagged leather carving or ask your own question. How to cut a stitched leather belt without it unraveling? Why can't you tool chrome-tanned leather? Is this leather veg tanned?